When your teeth have suffered the effects of decay, cracks, wear or other damage, you can depend on our team of family dentists to offer protective treatments that restore their appearance. Whether you’re looking to improve the shape and colour of your teeth or need to protect your smile from additional problems, our durable porcelain options are the perfect solution. 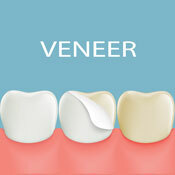 Porcelain and composite resin veneers are placed on the visible, front portion of your teeth to enhance the way they look. 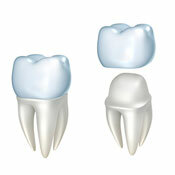 We frequently recommend them in areas where there are issues like crowding, gaps, uneven teeth or atypical enamel. Placing multiple veneers side by side often allows us to address the overall appearance of your smile without additional treatments such as braces. From dazzling porcelain veneers to affordable same-day composite designs, we offer the perfect cosmetic solutions to meet your needs and budget. A crown (or “cap” as some people refer to them) is a protective restoration that covers severely damaged or decayed teeth. Made from porcelain, your new crown is both functional and aesthetic, enhancing the strength and appearance of the treated tooth. Their shape, size and colour are handcrafted to match the neighbouring teeth for an overall natural look. 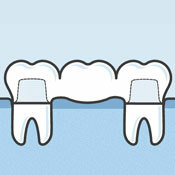 A bridge fills in the space caused by a missing or extracted tooth. It uses crowns on each end with a suspended “pontic” (false tooth) between them and is then anchored on top of the healthy teeth on either side of the open space in your mouth. Like our custom crowns, each of our bridges is made of aesthetically pleasing materials to enhance the overall look of your smile while also strengthening your bite. Both crowns and bridges can also be attached on top of dental implants, to replace your missing teeth in a holistic, noninvasive manner. We are preferred providers and accept all health funds. Same-day appointments are available. 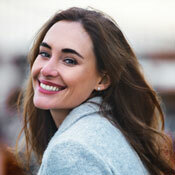 Book a consultation today to learn more and to find out which type of cosmetic restorations you qualify for.